One year after he saved the world from invading aliens in The Avengers, Tony Stark (Robert Downey Jr.) is back. With U.S. opening weekend box office receipts topping $174 million (and an additional half-billion overseas already), it’s clear the appetite for the “man in a can” (as Tony dismissively refers to himself in this outing) has yet to wane. I hoped to come out of IM3 with the same sense of elation I felt after The Avengers, but that didn’t quite happen. Still, it’s a darn sight better than 2010’s unfocused Iron Man 2. This is a true solo outing for Tony. Don’t expect any support from his fellow Avengers. Downey continues to work wonders with the character, this time trading Tony’s cocky self-assuredness for lingering PTSD following his New York ordeal. His relationship with main squeeze Pepper Potts (Gwyneth Paltrow) has fallen on rocky ground as a result. 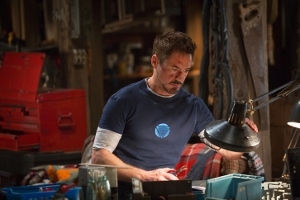 Unable to sleep regularly and consumed by worry that the invaders he confronted in NYC will return, Tony stays up at all hours tinkering with his army of “brobots” (a fleet of autonomous Iron Man suits). Once again, despite the millions spent on special effects, Downey is the film’s greatest asset. He manages to find just enough new quirks in Tony to keep his performance fresh. Tony’s world is rocked (yet again) after a new threat emerges, the Mandarin (Ben Kingsley). The mysterious bin Laden-esque villain takes over American television airwaves with ease, usually to claim the latest in a series of terrorist bombings. Wrapped up in the bombings is a rival tech genius, Aldrich Killian (Guy Pearce). When Tony’s head of security, Happy (Jon Favreau), is nearly killed in one such explosion, Tony decides to take on the Mandarin directly—with initially disastrous results that leave him without his usual gadgetry. Besides Downey digging deeper into the role than ever before, Paltrow is given more to do than ever as well. No longer simply a bystander or damsel-in-distress, Pepper takes a very active role in the heroics this time out. This tweaks the relationship dynamic between she and Tony, another invigorating shot of newness that helps distinguish the film. 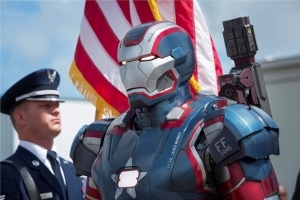 Rhodey (Don Cheadle) is back as well, this time with his War Machine alter ego rebranded by the government as Iron Patriot. Saying too much more would take us into needless spoiler territory. There are a few twists throughout IM3, at least one of which being totally out of left field, while another is quite predictable. The first two acts of the film, which was this time directed by Shane Black (who took over for Favreau, who helmed both one and two), are satisfying in every way. But by the time we ease into the finale, the whole thing begins to feel a bit overlong and exhausting. Black and his co-screenwriter Drew Pearce apparently forgot that less is often more and the various feats of derring-do begin to flatten out the climax rather than enhance it. I don’t think that all 130 minutes are necessary. As it progresses, it loses a bit of its heart in exchange for rampant visual flash. But the ride is ultimately worth it, especially since it’s packed with genuine humor. Never more so is this apparent than during the middle portion, in which Tony teams up with a young kid named Harley (Ty Simpkins). There has been talk of Iron Man 3 being the final installment in a trilogy, but with the second-highest opening weekend gross in U.S. history (and what will clearly end up in excess of one billion worldwide before it’s through) I can’t imagine this is it. We’re assured during the end credits that Tony will return (speaking of which, as usual, be sure to sit through to the very end), but that message might only be referring to the next Avengers film. Regardless of whether Tony Stark gets another movie all to himself again, Iron Man 3 bucks conventional thinking that dictates that any third installment of a franchise is likely to be a stale rehash. By making Tony more vulnerable than ever before, they allowed him to evolve into a more complex character. I love RD Jr! And I love Iron Man (who doesn’t?). I saw this on opening night and I thought it was great. We watched the first ones earlier in the day so we would be ready and pumped. I recommend! I thought this was a good movie. I love Iron Man. Now I can’t wait for Marvel’s The Avengers 2!!!!!!!!!! !